HOUSTON – ConocoPhillips (NYSE: COP) today reported fourth-quarter 2018 earnings of $1.9 billion, or $1.61 per share, compared with fourth-quarter 2017 earnings of $1.6 billion, or $1.32 per share. Excluding special items, fourth-quarter 2018 adjusted earnings were $1.3 billion, or $1.13 per share, compared with fourth-quarter 2017 adjusted earnings of $0.5 billion, or $0.45 per share. 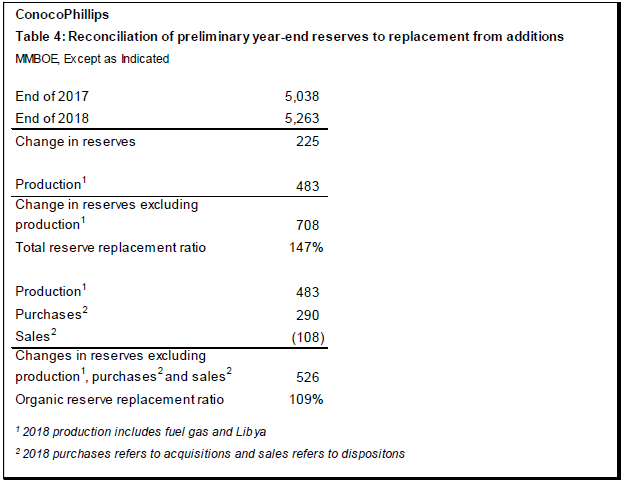 Special items for the current quarter included a gain from the sale of a partial interest in the United Kingdom Clair Field, deferred tax adjustments and amounts recognized from the PDVSA International Chamber of Commerce (ICC) settlement, partially offset by unrealized losses on Cenovus Energy equity. This news release contains forward-looking statements. Forward-looking statements relate to future events and anticipated results of operations, business strategies, and other aspects of our operations or operating results. In many cases you can identify forward-looking statements by terminology such as "anticipate," "estimate," "believe," "continue," "could," "intend," "may," "plan," "potential," "predict," "should," "will," "expect," "objective," "projection," "forecast," "goal," "guidance," "outlook," "effort," “on track,” "target" and other similar words. However, the absence of these words does not mean that the statements are not forward-looking. Where, in any forward-looking statement, the company expresses an expectation or belief as to future results, such expectation or belief is expressed in good faith and believed to have a reasonable basis. However, there can be no assurance that such expectation or belief will result or be achieved. The actual results of operations can and will be affected by a variety of risks and other matters including, but not limited to changes in commodity prices; changes in expected levels of oil and gas reserves or production; operating hazards, drilling risks, unsuccessful exploratory activities; difficulties in developing new products and manufacturing processes; unexpected cost increases or technical difficulties in constructing, maintaining, or modifying company facilities; international monetary conditions and exchange rate fluctuations; changes in international trade relationships, including the imposition of trade restrictions or tariffs relating to crude oil, bitumen, natural gas, LNG, natural gas liquids and any materials or products (such as aluminum and steel) used in the operation of our business; our ability to collect payments when due under our settlement agreement with PDVSA; our ability to liquidate the common stock issued to us by Cenovus Energy Inc. at prices we deem acceptable, or at all; our ability to complete our announced dispositions or acquisitions on the timeline currently anticipated, if at all; the possibility that regulatory approvals for our announced dispositions or acquisitions will not be received on a timely basis, if at all, or that such approvals may require modification to the terms of our announced dispositions, acquisitions, or our remaining business; business disruptions during or following our announced dispositions or acquisitions, including the diversion of management time and attention; the ability to deploy net proceeds from our announced dispositions in the manner and timeframe we currently anticipate, if at all;potential liability for remedial actions under existing or future environmental regulations; potential liability resulting from pending or future litigation; limited access to capital or significantly higher cost of capital related to illiquidity or uncertainty in the domestic or international financial markets; and general domestic and international economic and political conditions; as well as changes in tax, environmental and other laws applicable to our business. Other factors that could cause actual results to differ materially from those described in the forward-looking statements include other economic, business, competitive and/or regulatory factors affecting our business generally as set forth in our filings with the Securities and Exchange Commission (SEC). Unless legally required, ConocoPhillips undertakes no obligation to update publicly any forward-looking statements, whether as a result of new information, future events or otherwise. Cautionary Note to U.S. Investors – The SEC permits oil and gas companies, in their filings with the SEC, to disclose only proved, probable and possible reserves. We may use the term "resource" in this news release that the SEC’s guidelines prohibit us from including in filings with the SEC. U.S. investors are urged to consider closely the oil and gas disclosures in our Form 10-K and other reports and filings with the SEC. Copies are available from the SEC and from the ConocoPhillips website. Use of Non-GAAP Financial Information–To supplement the presentation of the company’s financial results prepared in accordance with U.S. generally accepted accounting principles (GAAP), this news release and the accompanying supplemental financial information contain certain financial measures that are not prepared in accordance with GAAP, including adjusted earnings (calculated on a consolidated and on a segment-level basis), adjusted earnings per share, cash from operations (CFO), free cash flow, return on capital employed (ROCE), adjusted operating costs, adjusted corporate segment net expense and dry hole and leasehold impairment expense. Operating costs is defined by the Company as the sum of production and operating expenses, selling, general and administrative expenses, exploration general and administrative expenses, geological and geophysical, lease rentals and other exploration expenses. Adjusted operating costs is defined as the Company’s operating costs further adjusted to exclude expenses that do not directly relate to the Company’s core business operations and are included as adjustments to arrive at adjusted earnings to the extent those adjustments impact operating costs. Adjusted corporate segment net expense is defined as corporate and other segment earnings adjusted for special items. Dry hole and leasehold impairment expense are components of and reported within exploration expenses. 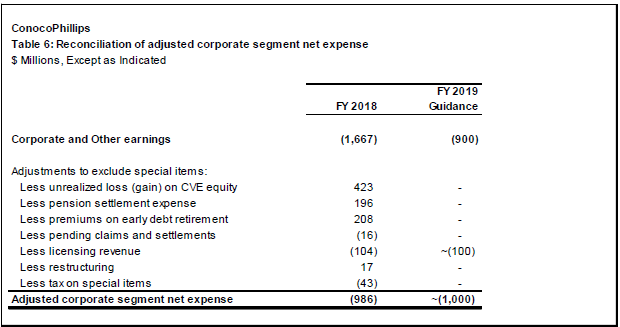 The Company believes that the non-GAAP measures adjusted earnings (both on an aggregate and a per share basis), operating costs, adjusted operating costs and adjusted corporate segment net expense, are useful to investors to help facilitate comparisons of the Company’s operating performance and controllable costs associated with the Company’s core business operations across periods on a consistent basis and with the performance and cost structures of peer companies. The Company further believes that the non-GAAP measure adjusted operating costs provides a more indicative measure of the Company’s underlying, controllable costs of operations by excluding other items that do not directly relate to the Company’s core business operations. The company further believes that the non-GAAP measure CFO is useful to investors to help understand changes in cash provided by operating activities excluding the impact of working capital changes across periods on a consistent basis and with the performance of peer companies. The company also believes that free cash flow is useful to investors as it provides a measure to compare CFO after deduction of capital expenditures and investments across periods on a consistent basis. The company believes that ROCE is a good indicator of long-term company and management performance. ROCE is a measure of the profitability of ConocoPhillips' capital employed in its business. 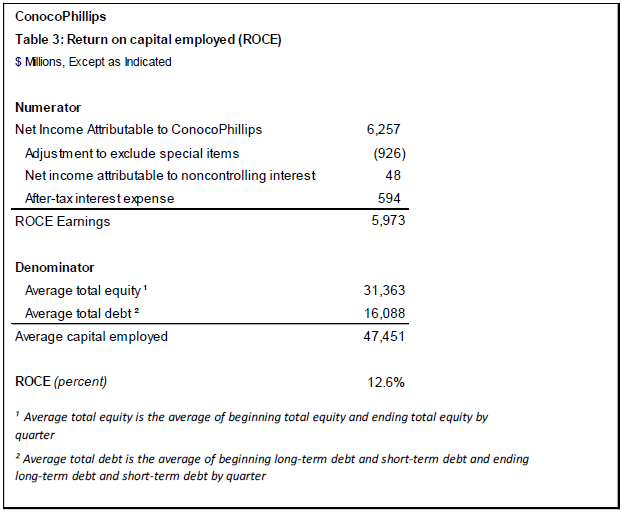 ConocoPhillips calculates ROCE as a ratio, the numerator of which is net income adjusted for special non-reoccurring items, plus after-tax interest expense, and the denominator of which is average total equity plus total debt. The Company believes that the above-mentioned non-GAAP measures, when viewed in combination with the Company’s results prepared in accordance with GAAP, provides a more complete understanding of the factors and trends affecting the Company’s business and performance. The company’s Board of Directors and management also use these non-GAAP measures to analyze the company’s operating performance across periods when overseeing and managing the company’s business. Other Terms –The release also contains the terms underlying production, production per debt-adjusted share, reserve replacement and organic reserve replacement. Underlying production excludes Libya and closed dispositions and acquisitions. Production per debt-adjusted share is calculated on an underlying production basis using ending period debt divided by ending share price plus ending shares outstanding. The company believes that underlying production is useful to investors to compare production excluding Libya and the full impact of closed dispositions and acquisitions on a consistent go-forward basis across periods and with peer companies. The company believes that production per debt-adjusted share is useful to investors as it provides a consistent view of production on a total equity basis by converting debt to equity and allows for comparisons across peer companies. Reserve replacement is defined by the Company as a ratio representing the change in proved reserves, net of production, divided by current year production. Organic reserve replacement is defined by the Company as a ratio representing the change in proved reserves, net of production and excluding acquisitions and dispositions, divided by current year production. The Company believes that reserve replacement and organic reserve replacement are useful to investors to help understand how changes in proved reserves, net of production, compare with the Company’s current year production, inclusive and exclusive of acquisitions and dispositions, respectively.